Bad news Monday from Qatar’s Court of Cassation: Poet Mohamed al-Ajami’s 15-year prison term was upheld as final. Al-Ajami’s lawyer, Najib al-Naimi, told media outlets that al-Ajami’s only remaining option was to appeal to the Emir, Sheikh Tamim bin Hamad Al Thani, for clemency. Al-Naimi told AFP that “I hope the emir will grant him an amnesty.” Reuters reported that the court’s decision had been reached in less than three hours. Al-Ajami was originally jailed for life last year, but in a February appeal, the sentence was reduced to 15 years. According to al-Naimi, the poet has been held in solitary confinement for nearly two years. Al-Ajami was arrested in November 2011 after the YouTube publication of his “Tunisian Jasmine,” a poem that praised Arab uprisings and criticised governments across the region. 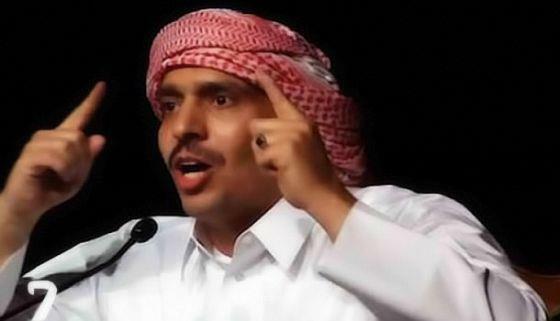 The case against him was ostensibly about a 2010 poem that criticized the emir, although many believe authorities are punishing al-Ajami for his Jasmine poem. I seem to have trouble opening your links lately and often only get a picture instead of the audio file. Oh boy, I am really not technologically inclined; I can only say that it works on my end. Others? This story is really disappointing. They should’ve upheld the life sentence (please note the sarcasm). I have worked in Qatar, and honestly the state of the rule of law does not seem to be this bad on the surface, very disappointing, i do not know if punishing someone for a crime of thought openly is better then framing another more “acceptable” crime, they do not bother doing that anymore. There is a very long road ahead of us (all of us) until we reach a state where the law really protects freedom of thought, sad.